"A time series is a sequence of data points, measured typically at successive points in time spaced at uniform time intervals. ... Time series are very frequently plotted via line charts. Time series are used in statistics, signal processing, pattern recognition, econometrics, mathematical finance, weather forecasting, earthquake prediction, electroencephalography, control engineering, astronomy, and communications engineering. 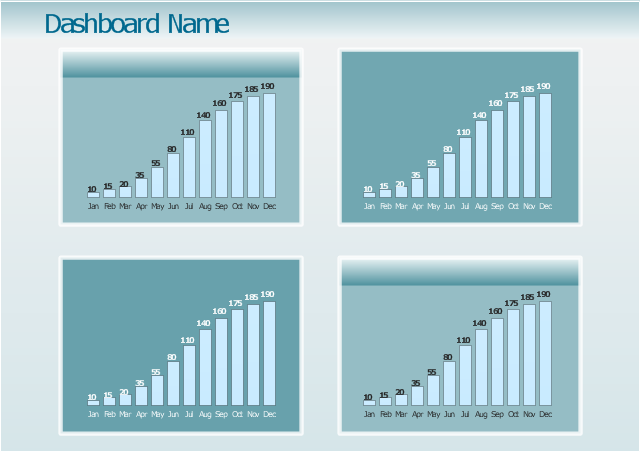 This dashboard template consist of 4 column charts. 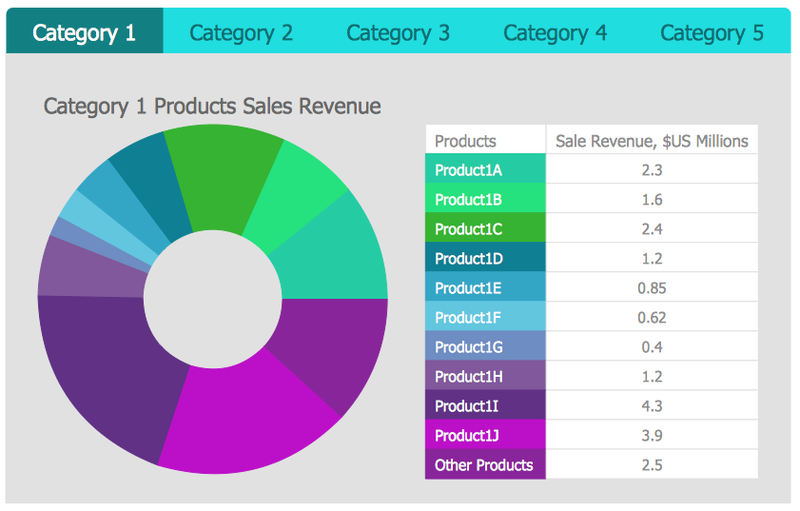 All these column charts are Live Objects displaying the data from the external source files. 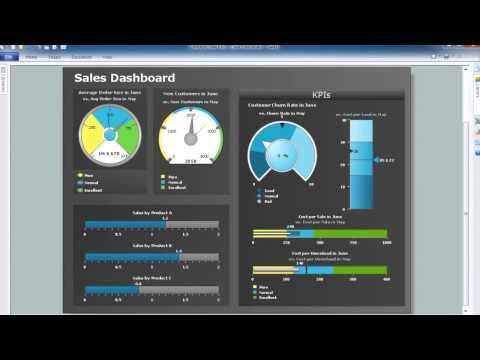 Use it to create your business performance management dashboard showing 4 time series of your metrics. 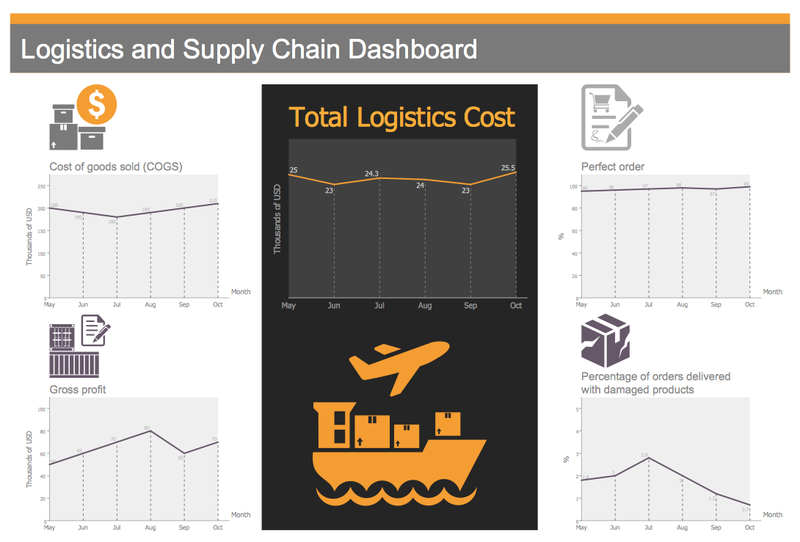 "A chart can take a large variety of forms, however there are common features that provide the chart with its ability to extract meaning from data. 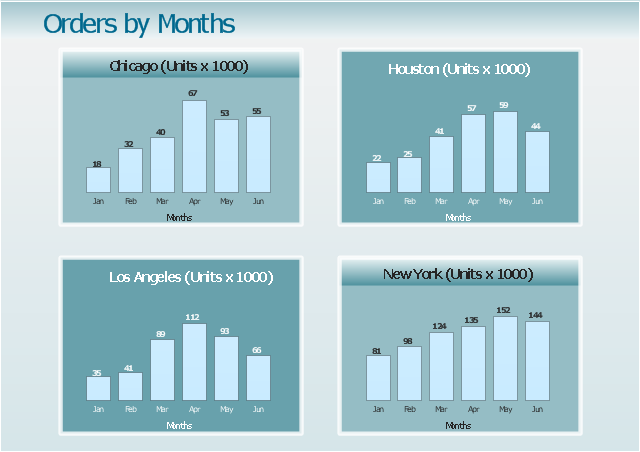 Typically the data in a chart is represented graphically, since humans are generally able to infer meaning from pictures quicker than from text. Text is generally used only to annotate the data. One of the more important uses of text in a graph is the title. 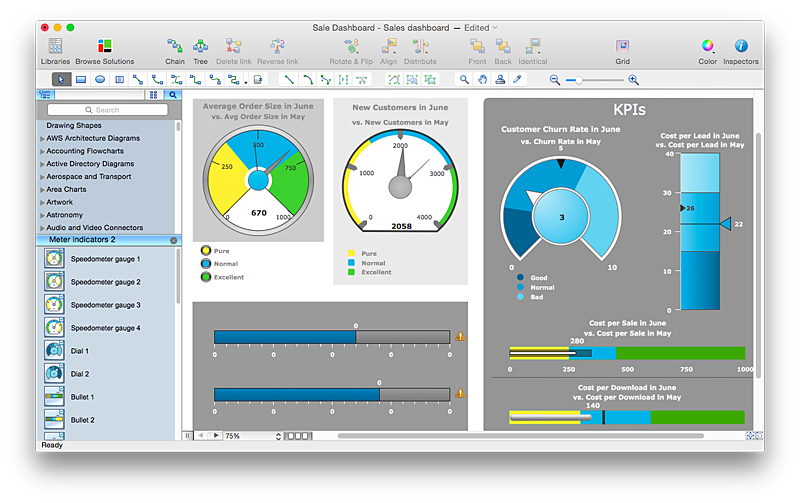 A graph's title usually appears above the main graphic and provides a succinct description of what the data in the graph refers to. 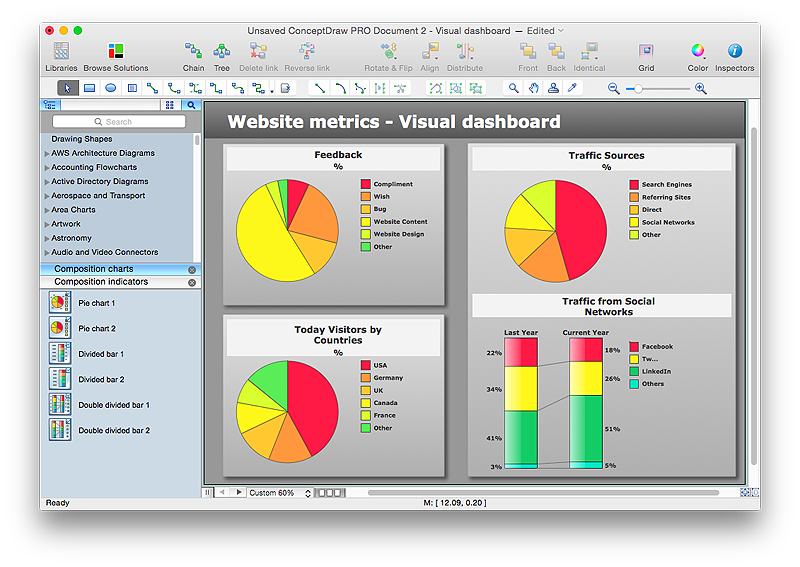 Within the graph a grid of lines may appear to aid in the visual alignment of data. The grid can be enhanced by visually emphasizing the lines at regular or significant graduations. The emphasized lines are then called major grid lines and the remainder are minor grid lines. The data of a chart can appear in all manner of formats, and may include individual textual labels describing the datum associated with the indicated position in the chart. The data may appear as dots or shapes, connected or unconnected, and in any combination of colors and patterns. Inferences or points of interest can be overlaid directly on the graph to further aid information extraction. 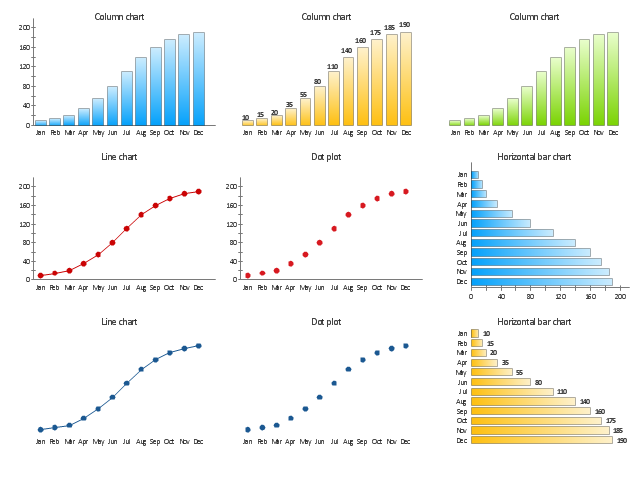 The vector stencils library "Time series charts" contains 10 templates: 3 column charts, 3 bar charts, 2 line graphs and 2 dot plots. 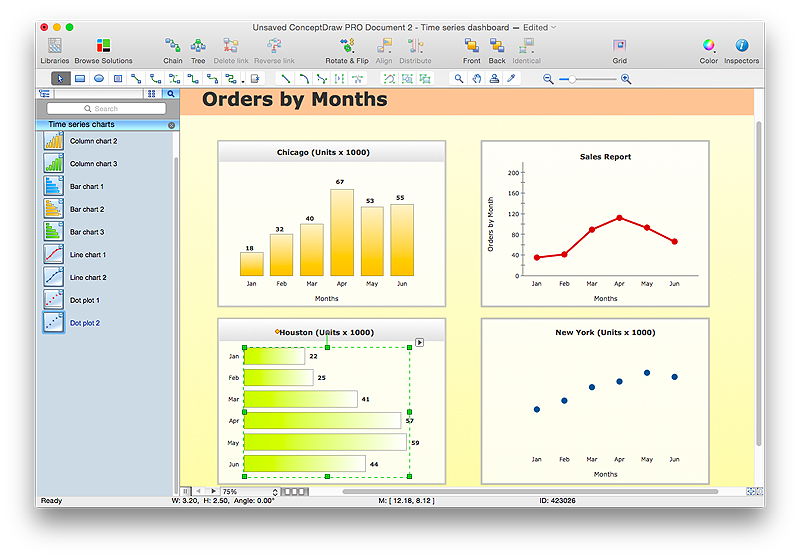 All these charts are Live Objects displaying the data from external data source files. 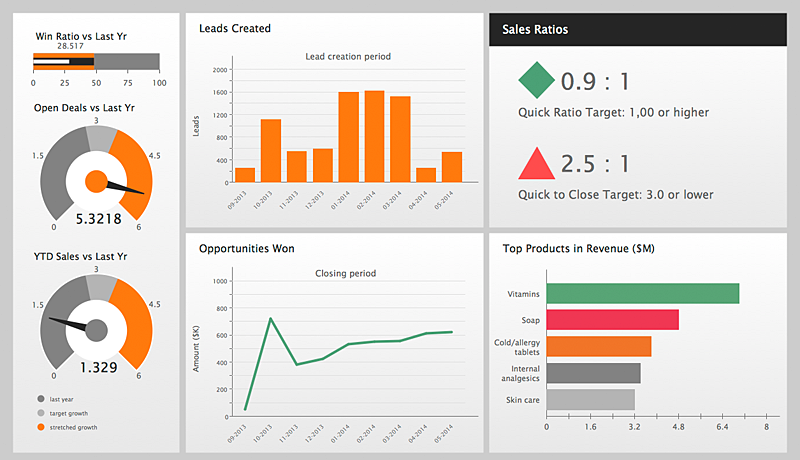 Use these chart templates to design your business performance digital dashboards using the ConceptDraw PRO diagramming and vector drawing software.